It is nineteenth century up-to-date with a vengeance. And yet, unless my senses deceive me, the old centuries had, and have, powers of their own which mere “modernity” cannot kill. Thomas Edison’s invention of the phonograph is both a perfect example of “modern” science and a harbinger of the problems brought about by modernity’s increased mechanization. It was originally conceived as a modified version of Alexander Graham Bell’s telephone. While Bell’s machine was a milestone in communication history, Edison felt that it was simply too expensive for most people to use. Consequently, he wanted to develop a “telegraph repeater”, which would “record Morse code signals by indenting dots and dashes on a paper tape,” thereby combining the telephone’s speed with the low cost of the telegraph (Kruse 1993). What Edison discovered, however, was that other acoustic vibrations could be stored in this manner. During the summer and fall of 1877, Edison and his staff perfected a device which would use a needle to inscribe onto a tinfoil cylinder sheet a mark, similar to a written code, which, when replayed, would produce an audible signal. From the moment the phonograph was unveiled to the public, it was an immediate sensation. Edison’s machine was viewed as a breakthrough in the history of technology, giving its inventor the dubious title, “The Wizard of Menlo Park.” Wizardry notwithstanding, the phonograph did not achieve mass-cultural success for another twenty years. In part, this is due to economic and technical problems which delayed the production of a cost-efficient device; however, many of these problems can be attributed to the fact that, although the phonograph eventually transformed culture, culture itself had a difficult time adjusting to these changes. As I will argue, the phonograph disrupted American and European attitudes towards language, communication, and identity and forced a rethinking of the conception of “humanity”. By examining the phonograph in light of these shifting historical contours, I hope to suggest ways in which the device exemplifies many of the questions and concerns that shaped social history and critical theory in the years between the United States Civil War and World War I. In particular, I want to focus upon the convergence of “human” and “machine” exemplified by the phonograph and how this leads to a shifting conception of writing and the development of modern mass media. In many ways, the phonograph owes its existence to a shifting definition of both “science” and the “scientist” in the nineteenth century. Prior to this time, “the word science… meant knowledge acquired by study” (Chapple 1986, 1), with “knowledge” defined in the classical sense as the understanding of both the physical and metaphysical realms. In many ways, science was part of what was generally called philosophy, which is a term suggesting a comprehensive (Gestalt) acquisition of knowledge. Science was perceived as the domain of wealthy amateurs who had the time and resources to engage in serious research (Haynes 1994, 104). These scientists, as Roslynn Haynes notes, could be saviours or villains, heroes or demons. On the side of the saviours are figures such as Issac Newton, “Britain’s national treasure” (Ibid., 50), whose Principia “demonstrated the predictive abilities of science and released scientists from the need to seek mystical causes for phenomena they had previously been unable to understand, such as gravity. It tamed the hitherto random and hostile universe into a well-oiled and entirely reliable clockwork model” (Ibid., 54). By giving names to fundamental scientific principles, Newton demystified certain aspects of science. Moreover, by demonstrating the universality of nature and its laws, he reconciled Christianity’s belief in a personal god with the logical and rational rules governing science. While Newton was deified, other scientists were perceived as dangerous figures whose knowledge could conceivably destroy or pervert the forces of nature. These scientists were often regarded as eccentrics whose isolation from human society led to dangerous tampering with forces beyond their control. This “mad scientist” was common in the literature of the eighteenth and early nineteenth centuries; in fact, this figure is still common in novels and movies today (witness Brent Spiner’s Dr. Brakish Okun in Roland Emmerich’s 1986 film, Independence Day). The most notable “mad scientist”, however, is Mary Shelley’s Dr. Frankenstein, whose isolation from others leads to “his suppression of emotional relationships and æsthetic experiences and the delusion that his work is being pursued in the interests of society, when in fact the real goals are power and fame; above all, he fails to foresee and take responsibility for the results of his research” (Haynes 1994, 5). Rather than attempting to understand the laws of nature, Frankenstein sought to reshape these laws according to his own will. Unlike the remainder of the novel, this note is not attributed to a particular character; in other words, it seems to have no specific human author. As Rosemary Jann notes, the foreword “adds to [the novel’s] authority and implies the presence of some omniscient author who vouches for the “truth” of the “simple facts” presented” (Jann 1989, 278). It sets out a systematic method of reading which parallels Van Helsing’s later insistence upon complete and accurate disclosure of facts. However, phrases like “all needless matters have been eliminated,” “no statement… wherein memory may err,” and “exactly contemporary” suggest that the facts which shape this novel are themselves subject to interpretation. This “construction” emerges more fully on the final page of Dracula, in which Jonathan Harker comments on the book itself: “We were struck with the fact, that in all the mass of material of which the record is composed, there is hardly one authentic document; nothing but a mass of type-writing” (Stoker 1897, 444). Whereas the foreword proclaims the novel’s absolute objectivity, by the end of the novel this objectivity has a human author which admits that these facts are “nothing but a mass of type-writing,” a trace of textual markings without significance or authenticity. This transformation from objective fact to subjective opinion suggests that an anxiety over authorship resides at the centre of the novel’s rational heart; it is as if, somewhere along the line, the novel’s belief in science is unhinged. In part, this “unhinging” of scientific authority can be attributed to science’s revision of nearly every commonly held assumption about life, history, physiology, perception and communication in the final decades of the nineteenth century. Besides inventions such as the phonograph and the X-ray machine, scientific discoveries like Thomas Henderson’s 1831 disclosure that the nearest star was twenty-four trillion miles away (Haynes 1994, 104) and Charles Darwin’s theory of evolution stripped the uniqueness away from the human race and repositioned the Earth within an ever-expanding universe. These transformations questioned the basic foundations of civilization, especially in terms of religion. Social Darwinism, for instance, became a political as well as a scientific and social doctrine, providing a justification for the rejection of social welfare and negating the Christian conceptions of charity and providence. Rather than offering a utopian hope for the future, science reaffirmed the “baseness” of humanity. What this implies, of course, is a particular definition of “human” that is linked to a spiritual or emotional centre. Consequently, science’s avoidance of spiritual issues negated the belief systems that maintained human beings’ uniqueness. As a result of this antagonism, many (both within and without the scientific community) began to explore the “non-material” aspects of life that were largely ignored by science. As William Boyd Carpenter (president of the Society for Psychic Research in 1912) notes, the individuals interested in exploring psychic phenomena were fundamentally “against the low-leveled materialism which threatened to rob mankind of its noblest prerogatives, its most splendid inheritances, and its most inspiring outlook” (Oppenheim 1985, 82). By lifting up humanity against Darwin and others, spiritualists and others sought to rethink humanity not as a machine or an ape but as a deity. The “spiritualist movement”, as it became known, began in Hydesville, New York in 1848, when Margaret and Kate Fox gained notoriety for producing “rapping” noises out of thin air (a talent later discovered to be fraudulent). The sensation caused by these “mediums” helped spark a movement that quickly spread across the United States and into Europe and became one of the largest and most significant religions of the period. The movement was based “on the proposition that, after death, a person’s spirit could remain in close touch with the living and could relay messages to them with the help of a medium” (Ibid., 165). Spiritualist mediums, in other words, functioned in the same capacity as a telephone operator: capturing distant signals and re-transmitting them to others. In fact, at its core, spiritualism was less a religious order than an attempt to resolve science’s inability to tap into the spiritual aspects of human existence. Spiritualist leaders (as well as psychic researchers, who, like Fox Mulder on The X-Files, saw themselves as objective witnesses who studied paranormal activity to determine their validity or authenticity) went to great lengths to scientifically rationalize their procedures. They considered the seance itself their “secret weapon”, for it was within such a “laboratory” that “demonstration or proof” could be calculated, recorded and preserved (Ibid., 63). While this purportedly suggests a scientific basis for understanding the supernatural (a contradiction in terms, it would seem), it similarly offers science a means by which to escape the accusations of inhumanity. Later in the article, Edison explains his interest in building a hyper-sensitive microphone which would be able to capture and store these “life units” as they leave a dying body — thereby extending the notion of recording beyond material sound and into the registers of spirits and energy. Edison’s maintained these beliefs until his death in 1931, when his last words, “It is very beautiful over there,” were publicized around the world. These comments persuaded Henry Ford to proclaim: “The greatest thing that has occurred in the last 50 years is Mr. Edison’s conclusion that there is a future life for all of us” (Wachhorst 1981, 40). As these comments suggest, cultural logic of the late nineteenth and early twentieth centuries believed that the scientist, the inventor and the medium all shared the power to understand and order both natural and supernatural laws. Although the phonograph is described as a product of witchcraft, its most startling and unsettling feature is its “human” voice. As the article notes, this voice is capable of speaking multiple languages in multiple voices, changing from a “lyric goddess” to a “street Arab” at a moment’s notice, and reproducing any type of “acoustic feat,” including sneezing, coughing and singing. This odd convergence of supernatural and human characteristics is also evident in the phonograph’s successor, the graphophone, a device developed by Charles Tainter in 1881 that used wax cylinders rather than the phonograph’s tinfoil cylinders. 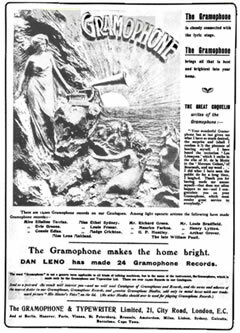 Tainter’s first words into the gramophone are telling: “G‑r‑r‑G‑r‑r‑ There are more things in heaven and earth Horatio, than are dreamed of in our philosophy‑G‑r‑r‑I am a graphophone and my mother was a phonograph” (New York Daily Graphic, 2 April 1878, quoted in Read and Welch 1976, 28). 1[1. The original Home Notebooks of Charles Tainter are located in the archives of the Smithsonian Institution’s National Museum of American History.] By calling his machine a child of the phonograph 2[2. To refer to an invention as a child is a common literary technique, most frequently used by authors toward their books. However, this metaphor recurs throughout the phonograph’s development, from its first recorded words (Edison singing “Mary had a Little Lamb,” a children’s nursery rhyme), and his development, in the 1880s, of a “talking doll”, built with a miniature phonograph inside its body. ], Tainter reaffirms Edison’s comment that the phonograph “is my baby, and I expect it to grow up and be a big feller and support me in my old age” (quoted in Josephson 1959, 171). The quote from Hamlet, however, adds to this familial theme a remarkably lucid contemplation of the supernatural. The quote is lifted from the scene in Shakespeare’s play immediately following Hamlet’s first encounter with the ghost of his dead father, who instructs the prince to kill his Uncle Claudius. Horatio, upon witnessing the encounter between ghost and sun, comments, “but this is wondrous strange!” whereupon Hamlet remarks, “And therefore as a stranger give it welcome. / There are more things in heaven and earth, Horatio, / Than are dreamt of in your philosophy.” 3[3. William Shakespeare, Hamlet, Act 1: Scene V.] The encounter between the human and the spiritual produces “strange” consequences in Hamlet because the ghost is attempting to manipulate human events. By employing this quote as a metaphor for the graphophone’s creation, Tainter effectively positions his creation as herald to a future world, while also suggesting that his device has a power that extends beyond those understood by its human creators. Although the earliest phonographs were made unlistenable after only a few playbacks (Roland Gelatt refers to the sound as “a grating, metallic travesty” [Gelatt 1977, 81]), both Edison’s and Johnson’s comments suggest that this prototype would lead to a technology capable of extending beyond the limitations set by time, space and death. What problematizes this formula, however, are the roles of language and writing in late Victorian culture. When the phonograph records sound, it inscribes marks onto a sheet of wax or tin; although they do not appear to be “writings” in the traditional sense, the fact that they store information that can be used and disseminated effectively characterizes them as writing. However, this writing, like the binary codes used in computer languages, is too complex to be read by human beings; as such, it is only understood by a phonograph. Because human beings cannot read this writing, there is a necessary separation between the act of writing and the act of reading. Consequently, the human agent who speaks into the phonograph is separated from his/her own voice once it is recorded (inscribed) onto the cylinder. As Charles Grivel notes, “this machine bears a paradox: it identifies a voice, fixes the deceased (or mortal) person, registers the dead and thus perpetuates his living testimony, but also achieves his automatic reproduction in absentia: my self would live without me — horror of horrors!” (Grivel 1992, 35) The phonograph, in other words, can capture, store, and reproduce the sound of a human voice; in theory, that voice would continue to live even after the body dies. In order to attain this semblance of immortality, however, it is first necessary to give control of one’s voice over to a machine. The above article emphasizes the phonograph’s humanity as if to “deliberately magicalize the apparatus as if it were animated by a little human inside it” (Taussig 1993, 208), with a full knowledge of social customs, an eager concern over others well-being, and a calm and graceful demeanor. Notably absent from this description, however, is any trace of the speaker. Was it Edison himself? Was it a man or woman? The author seems uninterested in these details; after all, the machine, not the voice, is the focal point. In fact, the human beings that do appear in this passage are peripheral. The narrator simply catalogues the events and the audience’s size, and Edison himself is completely subsumed by his invention: his actions are described in rigid, mechanical language, suggesting that he is more the device’s servant than its master. In his analysis of early technology’s impact upon social knowledge, Fredrich Kittler notes that “phonography means the death of the author; it stores a mortal voice rather than eternal thoughts and turns of phrase” (Kittler 1985, 237). In effect, this Scientific American article recognizes such a rupture in perception by raising many of the questions that would come to dominate political and cultural theory in the twentieth century: namely, the relationship between signs, signification and meaning, and the reauthorization of language within the new realm of mass media. Just as the phonograph has the potential to transcend death and heighten democratization (making music available to all citizens), it also alters the reality of a sound so that even “the illusion of real presence” cannot be certified without first checking with the phonographic recording. This is a point Theodor Adorno and Walter Benjamin, among others, make in the 1930s; however, by then, the focus had shifted away from the effacement of reality to fascism’s manipulation of that “illusion” by technologic means. This results in a newly conceived “reality” that is wholly subsumed within the “virtual” realm of technology. Although the phonograph garnered a great deal of attention between the years 1877 and 1897, few machines were actually sold. The reasons for this were numerous; one of the most significant reasons, however, were the machine’s own internal limitations, which included faulty sound and the impermanence of recording cylinders and disks. Although many improvements were made during this period, none were successful enough to instill commercial success. Another and perhaps more crucial reason for the phonograph’s initial failure was Edison’s marketing approach. In an essay entitled “The Phonograph and Its Future,” Thomas Edison explains that, to him, the phonograph’s “main utility… [is] for the purpose of letter-writing and other forms of dictation” and that, as a result, “the design [of the machine] is made with a view to its utility for that purpose” (Edison 1878, 531). On one level, there is a certain logic behind marketing the phonograph in this way, for it effectively compensates for the device’s poor sound quality. In this way, the machine can be seen to produce the desired effects, even if those effects are difficult to hear. Dictation, after all, is primarily a textual action rather than a verbal one. A person speaks into the phonograph in order to store the information on a cylinder, so that it could be transcribed later. The phonograph’s voice, here, is secondary to the information carried through it. Because business emphasizes efficiency and precision, Edison reasoned that the rather rudimentary capabilities of the early phonograph were ideal for these purposes. In retrospect, however, such reasoning proved false; in part, this was because the phonograph’s limitations made recording messages more difficult to accomplish than dictating a letter to a secretary. Likewise, by marketing the phonograph as a dictating machine, Edison effectively undermined the device’s most unique trait, its sound, particularly as it is used for the reproduction of music. To a great extent, Edison’s denigration of recorded music’s role in the marketing of the phonograph was intentional. Musical recordings, after all, were available as early as 1878, and the first commercial musical recordings went on sale in the mid-to late 1880s. In fact, in 1890, Edison’s company manufactured The Edison Concert Phonograph, which was designed exclusively to play music (Read and Welch 1976, 88). 4[4. The machine, however, could only play records manufactured by Edison’s company.] Although musical recordings were made with the earliest phonographs, there was no mass distribution of musical recordings until 1897. As this description indicates, the coin-slot gained popularity through savvy marketing that emphasized the machine’s voice, its status as “spectacle” and “event”, and the chance to hear music for a relatively small price. The coin-slots were, in effect, the first example of a “record player” — that is, a machine designed only to reproduce sound, not record it. Subsequent developments in phonograph technology would copy the coin-slot’s success and focus specifically upon the spectacle of hearing pre-recorded music. This notion of spectacle became central to the phonograph’s shift from the male-dominated business world to a domestic sphere largely defined and controlled by women. This change, however, was slow in coming; as Carolyn Marvin notes, throughout the nineteenth and early twentieth centuries, women were viewed as “parasitic consumers of men’s labors,” whose “frivolous electrical [telephone] conversations about inconsequential personal subjects were contrasted with the efficient, task-oriented, worldly talk of business and professional men” (Marvin 1988, 23–24). To a degree, such logic can be viewed as a reaction to the very threat which women posed as emerging participants in a mass culture which, at the time, was perceived as a realm of “dreams and delusions and of merely consuming rather than producing” (Huyssen 1986, 55). The fear of consumption, of falling into dreams and being “unproductive”, links mass culture with a feminized space of submission and passivity as opposed to a masculine space of power, authority and action. The separation between these spheres was pronounced, which is why the phonograph’s shift from public to private life is so crucial in understanding the period’s ambivalence towards the machine. During this period, the phonograph “gave rise to public discourses that sought to negotiate this new relationship between mass entertainment and domestic space” (Kruse 1993, 1). Edison’s machines were bulky; they did not look as if they belonged in a household because they appeared not as a fixture in a living room but “as a sort of visitor, who was not expected to stay” (Read and Welch 1976, 178). Likewise, the devices “were for the most part also recording machines, and this feature… implies design for portability. Then, as now, the portable instrument of whatever type never seems to appear ‘at home’ in the living room” (Ibid., 178–9). Like the Walkman and the Discman, the early phonographs were created with motion in mind. Because it was an object designed for portability, æsthetic questions were secondary; consequently, it was considered “obtrusive” to the “divided” space of the Victorian home, in which the “experience” of “private, familial, and social life within conventionalized and highly formalized settings” was a priority (Spigel 1990, 90). However, three events eventually changed the public perception of the talking machine. The first event was the mass marketing of Berliner’s gramophone, a device that was similar to Edison’s phonograph but used flat disks instead of the phonograph’s bulky cylinders. 5[5. While the phonograph’s cylinder device was initially more popular than the gramophone’s disk recordings (due to specific difficulties in maintaining sound continuity on a disk), the gramophone’s disks eventually became the standard model used sometime after 1900, and even Edison’s own phonograph company eventually began selling disk recording devices. Over time, the names “phonongraph” and “gramophone” were used to describe the flat disk record player.] The second event was the development of the music recording industry. The third and most important event occurred in 1901, when the Victor Talking Machine Company (later the Recording Company of America, or RCA) released the Victrola. The development of the Victrola accomplished two things: it remade the talking machine to resemble a piece of furniture, and it used advertising to reimagine the device not as a tool but as a voice. The Victrola was built into a small wooden cabinet, from which both the turntable and the horn were hidden from sight. Because this device was intended for home use, it could only play records, not record them. As such, the device did not need the obtrusive horns and tubes that were necessary to record sound; rather, it could hide all mechanical apparatuses within its case, thereby creating an æsthetically beautiful addition to the living room. The “feminization” of the device centred upon making the instrument appear to be a work of art; as an ad from a London journal (Fig. 1) makes clear, this was accomplished by aligning the instrument not with its technical achievements but with its voice. 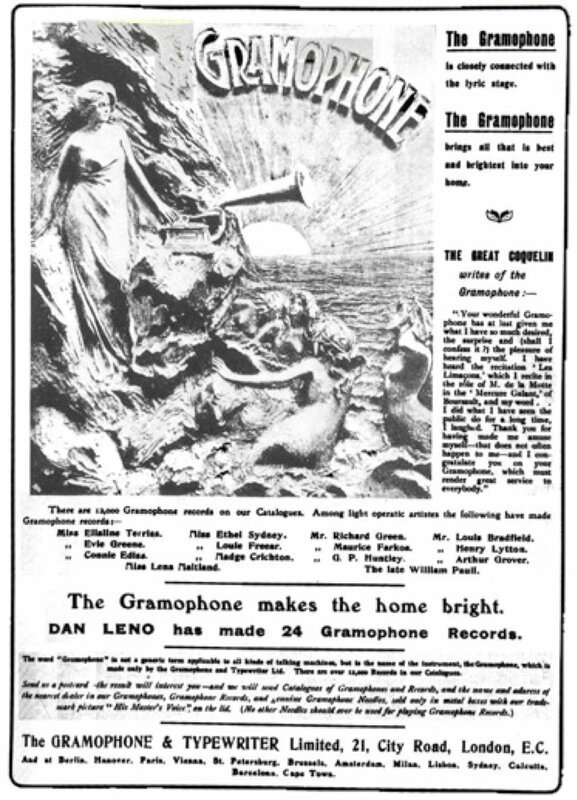 The ad consists of a woman standing beside the ocean and touching a gramophone, while mermaids hover in the water below her, gazing longingly at the machine. The horn on the device sticks out into the middle of the painting, directly above a large sun, whose rays spell out the words “Gramophone.” The design itself positions the gramophone in a mythic context, complete with mermaids who resemble the Sirens, which are described by Homer in The Odyssey as singing so beautifully that men forget about navigation and crashed their ships into rocks. In this case, however, the mermaids are not singing but rather listening to the beautiful voice of the gramophone. This advertisement does not foreground the device’s physical dimensions (it is proportionally dwarfed by the women and the text) but its mastery over sound, which is linked to women’s roles as peacemakers within the home. The gramophone supplants the phonograph by ensuring both domestic bliss and acoustic joy. This is perhaps most famously expressed by the RCA Victor logo, which features Francis Barraud painting, “His Master’s Voice.” This logo is successful because it perfectly captures the uncanny lure of phonographic sound: namely, the perfect reproduction of a person’s voice, to the point that even the master’s dog cannot tell the difference between the machine and the person. While this suggests that one’s voice is the sole definer of one’s “self”, the machine’s relation to the human voice does not disrupt but reinforce the master’s identity. The painting suggests that, if you cannot be there to take care of your dog, you can leave a part of yourself behind for the dog to listen to and obey. The irony of this painting is that the Victrola was designed only to play records, not record them, meaning that the power to record is not applicable in everyday life but resides in the hands of those capable of recording and distributing records. With the gramophone emerges the notion of the outside world living and speaking within the private home. Sound itself, moreover, refashions identity to accept one’s recorded voice as a facsimile of one’s body. By positioning the talking machine within the home, recorded sound begins to function as a language, eliding the actual “written” transcripts found on disks and cylinders. While the RCA logo accomplishes a restructuring of domesticity so that it can accommodate mechanical appliances generally found elsewhere, it accomplish this by negating the phonograph as a material object: that is, as a writing tool. Although machines capable of recording sound continue to exist, they have become less and less significant in the cultural logic defined by the recording industry. 6[6. While this has been true throughout the history of the recording industry, the advent of the home computer, the rise of the Internet, and the development of music recording and processing software are beginning to change this. These technologies allow individuals to create professional-sounding music and distribute it all over the world for an incredibly cheap price.] Since the turn of the century, the phonograph and gramophone have been associated with mass-produced music. The disturbance suggested by the phonograph’s rewriting of bodies and language, therefore, is normalized by the redefinition of the machine as an instrument of culture. This “disturbance” continually returns to unhinge reality and redefine human subjectivity as a product of technologic advancements. Chapple, J.A.V., Context and Commentary: Science and Literature in the Nineteenth Century. London: MacMillan Education Ltd., 1986. Clark, Ronald W. Edison: The Man Who Made the Future. New York: G.P. Putnam’s Sons, 1977. Edison, Thomas. “The Phonograph and its Future.” The North American Review, no. 262 (May-June 1878). Emmerich, Roland, dir. Independence Day. With Will Smith, Bill Pullman and Jeff Goldblum. 20th Century Fox, 1996. Gelatt, Roland. The Fabulous Phonograph: 1877–1977. New York: MacMillan Publishing Co. Inc., 1977. Grivel, Charles. “The Phonograph’s Horned Mouth.” In Wireless Imagination: Sound, Radio, and the Avant-Garde. Edited by Douglas Kahn and Gregory Whitehead. Cambridge MA: The MIT Press, 1992. Harper’s Weekly. 30 March 1878. Haynes, Rosalyn. From Faust to Strangelove: Representations of the Scientists in Western Literature. Baltimore and London: Johns Hopkins University Press, 1994. Huyssen, Andreas. After the Great Divide: Modernism, Mass Culture, Postmodernism, Theories of Representation and Difference. Edited by Teresa de Lauretis. Bloomington and Indianapolis: University of Indiana Press, 1986. Jann, Rosemary. “Saved By Science? The Mixed Messages of Stoker’s Dracula.” Texas Studies in Literature and Language 31 (Summer 1989). Kahn, Douglas. “Death in Light of the Phonograph.” In Wireless Imagination: Sound, Radio, and the Avant-Garde. Edited by Douglas Kahn and Gregory Whitehead. Cambridge MA: The MIT Press, 1992. Kittler, Fredrich. Discourse Networks 1800/1900. Trans. Michael Metteer with Chris Cullens. Stanford: Stanford University Press, 1985. Kruse, Holly. “Early Audio Technology and Domestic Space.” Stanford Humanities Review 3 (Autumn 1993), pp. 1–16. Marvin, Carolyn. When Old Technologies Were New: Thinking About Electronic Communication in the Late Nineteenth Century. New York: Oxford University Press, 1988. Oppenheim, Janet. The Other World: Spiritualism and Psychical Research in England, 1850-1914 (Cambridge and London: Cambridge University Press, 1985. Read, Oliver and Walter L. Welch. From Tin Foil to Stereo. Indianapolis: Howard W. Sams and Company, 1976. Ronnell, Avital. The Telephone Book: Technology, Schizophrenia, Electric Speech. Lincoln: University of Nebraska Press, 1989. Rothman, A.D. “Mr. Edison’s ‘Life Units’: Hundred Trillion in Human Body May Scatter After Death — Machine to Register Them.” New York Times. 3 January 1921. Spigel, Lynn. “Television in the Family Circle: The Popular Reception of a New Medium.” In Logics of Television. Edited by Patricia Mellencamp. Bloomington and Indianapolis: Indiana University Press, 1990. “The Talking Phonograph.” Scientific American. 22 December 1877. Wachhorst, Wyn. Thomas Alva Edison: An American Myth. Cambridge MA: The MIT Press, 1981. Watson, Thomas A. Exploring Life: The Autobiography of Thomas A. Watson. New York and London: Appleton & Co., 1926. Michael Heumann holds a PhD in English from the University of California, Riverside. 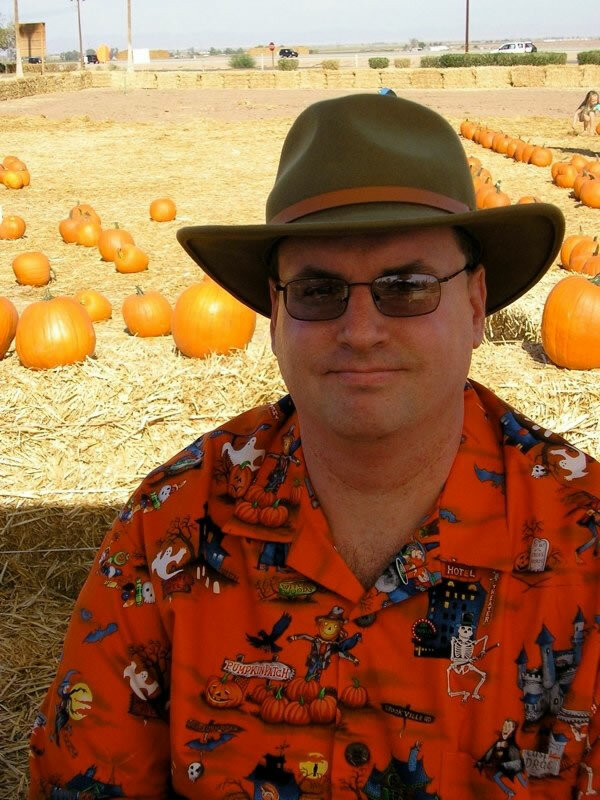 He is currently an Associated Professor of English at Imperial Valley College in California. He also records music under his own name and various pseudonyms. eContact! 14.3 — Turntablism (January / janvier 2013). Montréal: Communauté électroacoustique canadienne / Canadian Electroacoustic Community.